Located on the banks of the Mystic River, Mystic Museum of Art is in the heart of historic Downtown Mystic. Commanding a spectacular waterfront view from its lovely terraces and grounds, the gallery is within easy walking distance to the area’s premiere attractions and accommodations. Unique and beautiful, MMoA’s exhibitions and galleries provide the ideal backdrop for cocktail parties, dinners, fundraisers, and more! MMoA’s spacious galleries feature 16′ ceilings, skylights and an adaptable layout for a variety of events and guest capacities. 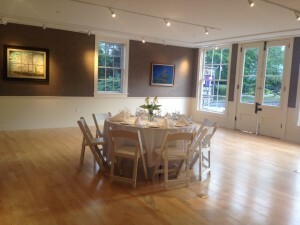 Fully handicap accessible, with a complete kitchen and ample parking, the Mystic Museum of Art is the perfect venue for your event. 15 Water Street Gallery, the former landmark Emporium building, was recently renovated as an art gallery and makes an exquisite location for your event. 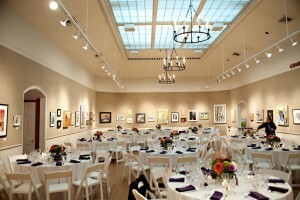 The gallery can easily accommodate 50 guests for a seated dinner or 60 for a cocktail reception and is ideal for more intimate affairs as rehearsal dinners, holiday parties or corporate dinners. For more information and photographs of the venue, download the the MMoA Special Event Rentals Brochure and the MMoA Special Event Rentals Information Guide.